Gemma Romain has written a guest blog about working with Iroko Theatre Company. At The Equiano Centre we’ve recently been working with the Dig Where We Stand project, linking up with the Iroko Theatre Company based in Stratford, East London. 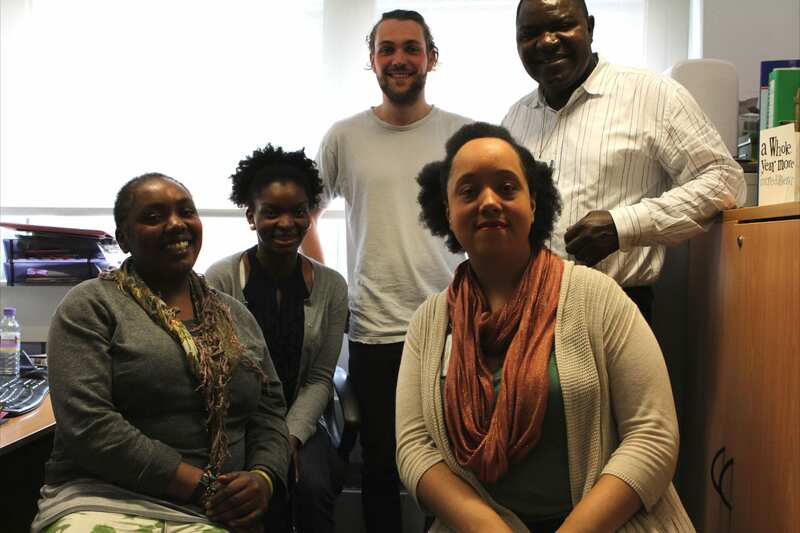 We worked with them on their fascinating project, Homage to Canning Town African Ancestors, providing advice on resources, archiving, creating exhibitions and to share and learn from one another (our experiences of researching black history). This HLF-funded project has been documenting and exploring the African presence in Canning Town’s history and presenting this history together with the experiences of Canning Town African communities today. Left to right: Ego Ahaiwe, Ife Adedeji, Andrew Turley, Gemma Romain and Alex Oma-Pius. Photograph taken on 7 May 2013. © Andrew Turley, 2013. As Iroko Artistic Director Alex Oma-Pius told me and fellow project member Ego Ahaiwe, the project was originally inspired by the Canning Town street names he came across which referenced African geography and history, such as Mafeking Road and Dongola Road. He set out to find out more about why these African names could be found in East London streets, documenting in the process the history of British imperialism in Africa in the late nineteenth century. 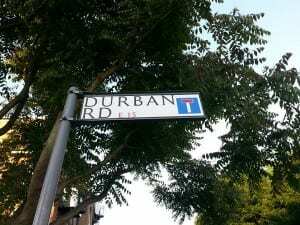 Photograph of Durban Road street sign by Ego Ahaiwe, 21 June 2013. One of the many East London street signs referencing African places and histories. © Ego Ahaiwe, 2013. Research for their exhibition and pamphlet was brought together by a team of volunteers including Jenny Farren, Andrew Turley and Illina Huq and was curated by Ife Adedeji. It explores and documents this local and international history, focusing on histories such as ethnically-mixed black and white communities in Crown Street, which became known as ‘Draughtboard Alley’; racism against sailors in their lodging houses during 1917; and the role of Africans in the Second World War. Interwar Black activists and students were also highlighted including Ladipo Solanke, the Nigerian student and political activist who in 1925 co-founded the West African Students Union (WASU); Kamal Chunchie, the Sri Lankan founder of the East London-based Coloured Men’s Institute; and Stella Thomas, a WASU member, who studied at the University of Oxford in the 1920s and was called to the bar in 1933. Iroko’s research was shared with the local East London community through the exhibition and with a fantastic musical performance which took place on 21 June 2013. Composed by Juwon Ogungbe, directed by Iroko Artistic Director Alex Oma-Pius and performed by Afla Sackey, Yaw Asumadu and Juwon Ogungbe, the piece focused on two fictional characters – Kweku and Kwesi – African dock workers living in early twentieth century Canning Town – and through their voices we see brought to life some of the histories and experiences of the sailors which had been highlighted in the exhibition. Iroko Theatre’s melodic and harmonious song of Eshe, the Swahili word for life, resonated through the East End on a sunny Friday evening. A performance of song saluting our African East End Ancestors, reminding us of the life they had experienced, the barriers they had faced and their achievements. Our spirits lifted through the tales as they took us on, a trip down memory lane, along streets that had previously had little or no personal relevance. The event informed us of the background of these streets and areas. Durban Street that I had ignored when I walked out of the station on the way to the performance now grabbed and demanded my attention on the way home. I hadn’t known that there had been 1 million Africans in the Second World War. The exhibition and accompanying booklet had so many useful facts, that I will continue to share “did you know?…..” Iroko Theatre gently fills in some of the gaps to a history widely unknown. 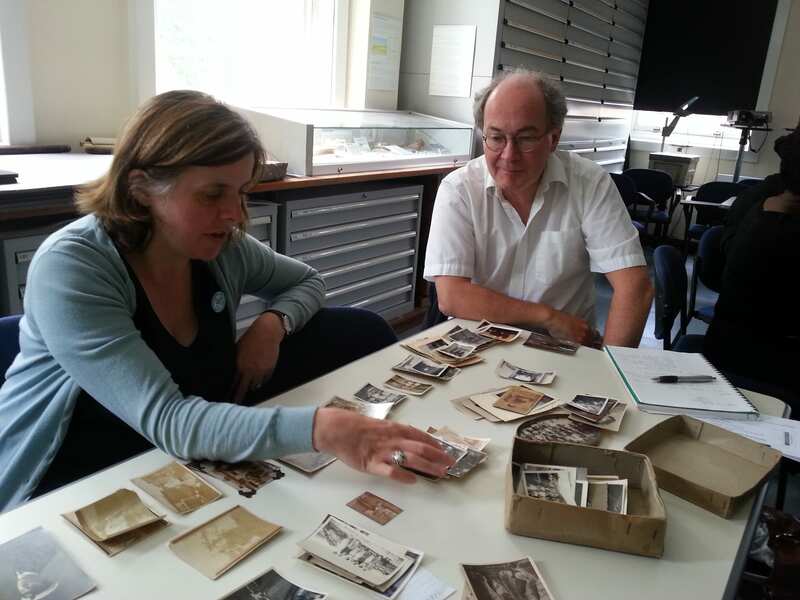 On Saturday 29th June we held our last workshop for All Our Stories groups on archiving and preservation. The workshops looked at archiving both the outcomes that the projects had created and the materials that they have been collecting. The sessions looked at different kinds of materials and archives, with a view to ensuring their preservation for as long as possible. Anna Sexton and Jenny Bunn began the day with a workshop that looked at paper and digital archives. The workshop used Anna’s personal family archive as a practical example, with which participants followed the processes that Anna explained. After lunch, Glynn and Adam from the Museum of London’s London Archaeological Archive and Research Centre (LAARC) presented a session on looking after objects. They began by looking at materials, how to identify them and assess their condition. They then moved on to consider the needs that different materials have and the risks associated with storing them. Adam finished the workshop by demonstrating how to pack a coin, an exercise which showed the kinds of materials and techniques that need to be used to pack objects to the LAARC’s standards. Andrew finished the day by discussing how to archive oral history. Andrew looked at archiving and lodging material with a repository, how to ensure the best possible standards and documentation. Sarah and Gabriel went to Martin Primary for the launch of the East Finchley Big Dig last week. The project aims to find out more about the past of East Finchley, through digging test pits in the gardens of residents. These keyholes into the archaeology of East Finchley will be mapped by time period to help create a broader understanding of the history of settlement in the area. Roger from the East Finchley Community Trust introduced the project. Bill Bass of the Hendon and District Archaeology Society (HADAS) introduced himself and the society, who will be working with us on the project. Gabriel talked about the history of test pitting activities and his previous experiences of using the technique. He also explained how important each test pit is, regardless of what is (or isn’t) found in it! Even pits where nothing is found provide ‘negative evidence’, suggesting that settlement was not present, which further helps our understanding of the area. Five test pits are planned in this first year of East Finchley Big Dig, which we hope to work on with East Finchley Community Trust and HADAS in the future. Sarah and Tina met with Kayte McSweeney from the Science Museum to share our experiences, news of our projects and ideas for collaboration. We’re hoping to work together more closely in the future.